China’s prestigious Tsinghua University has triggered heated debates one month after its 100th anniversary of founding as it has named one teaching building after a well-known clothes brand. The university came to the spotlight on Tuesday after a picture of the building’s new name was posted online. People blamed the university for “selling itself” and the incident was labeled as the “falling of the spirit of universities,” while others said it was normal for campus buildings to be named after a donor. 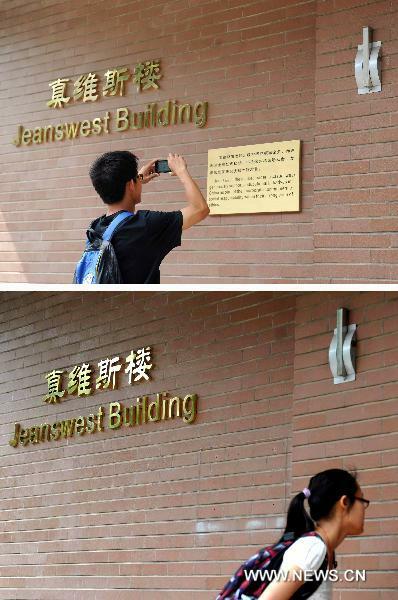 The No.4 teaching building of Tsinghua, built in 1987, is dedicated with shining Chinese and English characters of “Jeanswest Building,” following a line saying that Jeanswest, as a leading company of casual clothes, has contributed its share to the nation’s education. So, Jeanswest Building does sound a bit better than the No.4 teaching building. But not much. And it does beg questions about how far a university might go in offering naming rights in return for a decent donation. Whilst the University of Poppleton has probably led the way in the recent past (actually I’m guessing it has a number of buildings named after popular pork-based products), might we expect the Confused.com learning resources building or the Kwik Save Student Services Centre at a UK campus someday soon?